Q: Can you talk about your musical history and what in particular got you interested in lead guitar? A: Thanks a lot for inviting me for this interview. My first instrument was the keyboard that I dabbled on as a kid. I had picked up popular Indian songs of the time and some western songs that I’d heard over the radio by ear. It was during my undergraduate university years that I gravitated towards the guitar. I was exposed to Nirvana, Def Leppard, Bryan Adams and liked the look and sound of the instrument. At some point, I heard the classic album Friday Night Live in San Francisco by John McLaughlin, Al DiMeola, and Paco De Lucia. That changed my life completely. Then I was further hooked by the dynamism of lead guitar by hearing virtuosos like Steve Morse, Vai, Satriani, and Petrucci. It strengthened my motivation to try to learn to play like the greats. Q: Your music combines lead guitar rock such Joe Satriani with Eastern Influence and more. What is the writing process like? A: My writing process is quite organic. Most times I’m jamming to a drum track or a tabla loop, in my home studio and playing around with chord progressions. If I find something that captivates my ear I record it and then work off that structure. I go with the flow and let the jam develop naturally and see where it takes me. After that, it’s a process of refining and seeing what best serves the song. I might come up with a string of different ideas and then I pick and choose what sounds best. Then I work on lines with inflections to provide that Eastern sound. I will try to emulate lines from other instruments like the bansuri (Indian bamboo flute) or the dilruba (Indian bowed string instrument) and incorporate that into my fusion palette. Q: What attracts you to instrumental music? A: There is a lot of freedom in Instrumental music with respect to thematic development, form and extending sections. One has the flexibility of changing tempos, meters and keys quite unexpectedly and keep the listener on their toes. Of course, if you have an outstanding vocalist, one can still implement such changes. However, with vocals you usually have to be a little more aware and must consider the person’s range and comfort zone. To break away from that allows me to play with a much more independent and freer hand. Q: Although your music is instrumental are there any themes or concepts that run through your album Ma De Re Sha? A: The entire album is inspired by my interactions with people I have met. Musically, there is also an Indo-Fusion theme that runs through the album with the inclusion of tablas, flutes and guitar lines reminiscent of Indian instruments like the dilruba. The album brings many diverse instruments and many different genres like rock, metal, jazz, folk, ambient and Indian Carnatic music. The recording, production, mastering, physical media manufacturing and crowdfunding brought together entities from the US, Spain, India, Germany and Hungary. So the overarching theme for the album is about global unity through diversity. ​Q: Can you talk about the recording process? What was it like in the studio? A: I am fortunate to have a good home studio where I did all my tracking and rough mixes. Initially, the album was meant to be a digital-only online release, so I didn’t want to go down the expensive route of renting a professional studio. The upside to having your own studio is that you have immense flexibility to do takes and perform multiple permutations and combinations of what you’d like the sound to be. Consequently, you can really take your time to tailor your song to your exacting requirements without the pressure of studio time and money. The downside to having your own studio is that you can spend a lot of time second guessing everything and not making any significant progress. This is also why the album took five years to make. There were some much needed breaks during that time! In my case, the pros greatly outweighed the cons. My co-producer and percussionist, Bruce Ng, is in Germany and the bassist Ruben Rubio lives in Spain. There is no way I would be able to hire a studio and have them fly down to record my tracks. They both also worked on their tracks from their home studios. This arrangement offered me the flexibility to musically converse with them without the hurdles that geographical distances bring. The other benefit was that when Brett Caldas-Lima from Tower Studio in France mixed our tracks, we could each preview them in our own time zones and provide consolidated feedback. I work a 9-5 day job and it would be impossible for me to take the kind of time required to track an entire album in a professional studio and then go in person to other studios for mixing and mastering. My recording and studio experience was quite different from what I traditionally imagined the process to be. But, I do think this is now quickly becoming the norm with software being so readily available and affordable, and technology bringing us closer. Q: What else do we need to know about Rahul Mukerji? A: I am also an accomplished visual artist, photographer and frequently exhibit my work around the Washington D.C. tristate area. I work in many mediums from the traditional to digital. My art encompasses paintings, wood burning, fabric design, digital sketches, fractal imagery and animation among others. I am looking to continue exploring different types of visual art in the coming years. 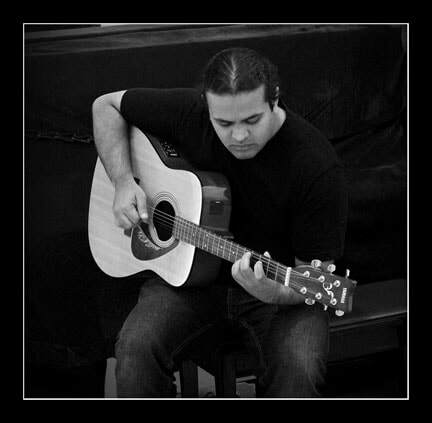 Music wise, I am looking to delve more into the Indo-Fusion style and possibly collaborate with local artists in DC. I’ve found that there is a small but rich and thriving scene for such music and I will hopefully be able to enlist like-minded individuals and also perform tracks from my album live soon. I am also starting to ponder a follow-up to my debut and trying to assess what direction it should take. Since the album was positively received, I think I may have found my niche and I’d like to focus on that while continuing to explore the boundaries. I’m really excited to see what the new year will bring!